Nvidia, the leader in graphical processing units (GPUs), has opened an early access program for its Holodeck collaboration platform introduced earlier this year. Developers, engineers, or anyone else who would like to use the advanced platform merely need to apply for early access and then, when approved, download it and provide feedback, announced Nvidia at its GPU Technology Conference (GTC) for European developers taking place this week in Munich. The Nvidia Holodeck is a virtual reality (VR) platform designed to allow designers, developers, engineers, and the like to collaborate in a fully immersive, highly realistic, physically simulated virtual setting. The product obviously shares its name with the environment made popular on "Star Trek: The Next Generation," but the similarities extend beyond the name. Within the Star Trek Holodeck environment, real-life rules applied -- so if a crew member fell down a cliff, he'd get hurt. The Star Trek Holodeck included built-in safeguards (which were always stupidly turned off) to ensure against injury. With its Holodeck, Nvidia, too, aims to mimic the real world. It has incorporated the laws of physics so when somebody within the environment drops something, it falls. If a light shines, a shadow is cast. Things like that. One of the early Holodeck use cases is Nvidia's robot simulator. One of the challenges of training robots is to take a variety of scenarios into consideration. For example, training a robot to walk means having to set up simulations for walking not only on a flat surface but also up stairs, down stairs, at an angle, and so on. These tests can often take days or even weeks to set up. But in the Holodeck robot simulator, designers can set up and run tests virtually, uploading the data into the robot. When the physical robot "wakes up," it will have full knowledge of how to walk without further training. The ability to run the tests in the virtual environment saves countless hours as well as a significant amount of money. 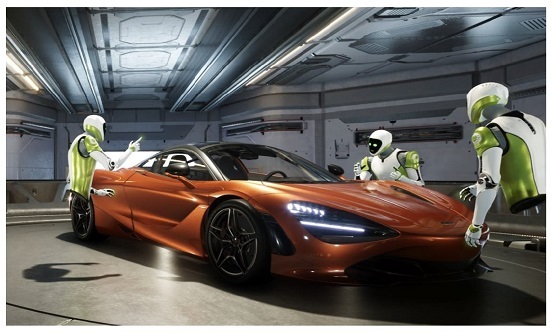 In addition to using real-world physics, Nvidia has outfitted Holodeck with photorealistic graphics so things appear as they would in real life. This includes objects casting shadows, reflecting images, and other factors that could be important when designing a product. The ultra-high-resolution graphics means designers can focus on designing the product to look exactly like they want it to instead of having to simplify the model to render the product correctly in a virtual environment not equipped to provide a life-like look. For example, car designers might want to see what the light pattern on a new type of headlight might look like. Instead of having to change the physical component out several times, the designers can try them in the Holodeck and then pick a winner based on the tests. Holodeck also contains a number of artificial intelligence-enabled simulator tools so designers can train different types of intelligent machines, like autonomous vehicles and drones, through simulations and then transfer the intelligence to the physical object. This is similar to the process I described above, but extends to almost any type of object imaginable. Geographically dispersed -- even global -- teams can improve how they work collaboratively, simulating the effect of being in the same lab. As shown in graphic below, the three people around the car could be physically located in the U.S., Europe, and Asia, although they appear to be in the same room to the other participants. Nvidia's latest and greatest GPUs, which have revolutionized these types of environments, power Holodeck. Unlike CPUs, which process single threads really fast, GPUs process multiple threads simultaneously -- necessary for handling high-resolution graphics in a manner that makes video games realistic. GPUs aren't just for graphics any more. The advanced performance capabilities are key to making AI, machine learning, and VR scale. Opening Holodeck beyond Nvidia's own use is an important step in understanding how industries such as automotive, health care, and science might use such a platform. When Nvidia introduced Holodeck earlier this year at the U.S. GTC, CEO Jensen Huang told me he wasn't sure how the company would monetize the platform because it couldn't think up all the use cases. Opening up Holodeck to outside companies can fuel innovation and create ideas on how to leverage the product. Some of the smartest AI talent work at Nvidia, but that can't possibly match the innovative power of an entire community. I imagine a time will come when we do many of our day-to-day tasks in virtual simulators. This would include changing the way we educate kids, design homes, or customize a car. However, as the saying goes, "Rome wasn't built in a day." Hopefully Nvidia's early access program will fuel innovation in AI and VR, and accelerate the path to "what's possible."